The Fellowes Powershred 53C Cross-Cut Shredder is suitable for individual use in the home or home office and will shred up to 10 sheets of 70gsm paper at a time. Paper is shredded into particles measuring 4 x 35mm and this gives the shredder a P-4 security rating (suitable for the shredding of highly confidential documents). As well as paper, the shredder will shred a variety of materials including credit cards and CDs/DVDs (via their own dedicated shredding slot). The shredder will also get through staples and small paperclips, so there is no need to spend time removing these prior to shredding. The 23 litre bin has a lift off head with handle and is easy to empty. Other features include: a reverse option to help clear paper jams; an overheat indicator and a viewing window so you can see when the shredder needs emptying. The shredder has a 220mm paper entry width (for A4 paper shredding) and can handle up to 3 minutes continuous shredding, after which it will need a 30 minute cool down period. 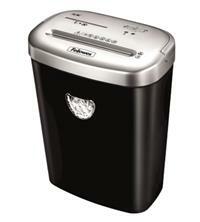 Warranty on the Fellowes Powershred 53C Cross-Cut Shredder is 2 years for the machine and 5 years for the cutting blades.